I am using Mac OSX Sierra (10.12.1), and I reinstalled QGIS 2.14.7 (and python 2.7, after a crash and clean install of OSX). Now when I open QGIS I get an error for Pyspatialite Plugin. I found the same question for Fedora (Pyspatialite Installation Error), but the solution doesn't seem to work for my system. I've searched everything I can for how to install pyspatialite with pip, but in the terminal I keep getting a bailout error when I try "pip install pyspatialite", and I'm new to the terminal and to python so I can't figure out the message. 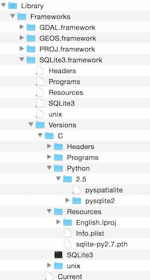 When I installed QGIS (from kyngchaos), I installed the list of python modules (Numpy etc) and I've now brew installed sqlite3, but I'm still getting the bailout error. Did I incorrectly install something or am I missing a dependency, specifically for OSX? Not the answer you're looking for? Browse other questions tagged qgis python installation spatialite osx or ask your own question. “ImportError: No module named gdalsrsinfo” What's the issue? How to fix python ImportError: DLL load failed: The specified module could not be found? Installing Location Lab plugin in QGIS on Mac OSX?